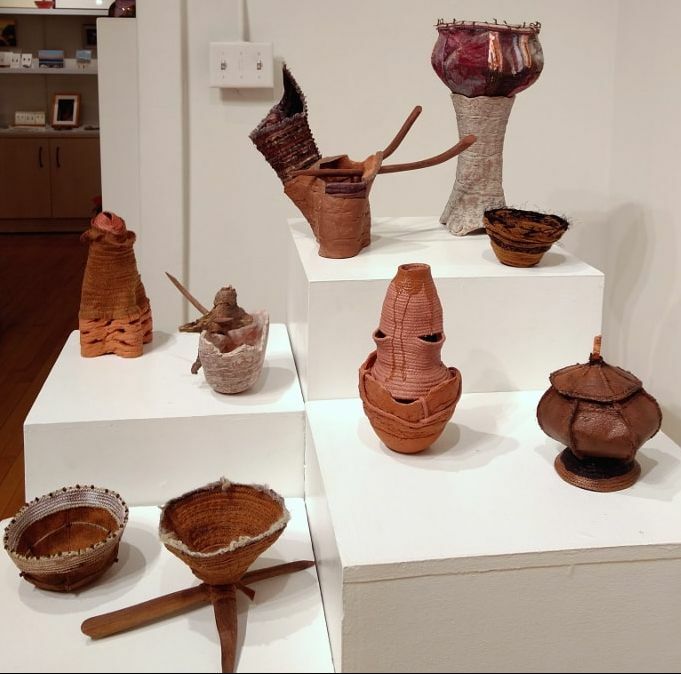 In February of 2018 There was a show of collaborative works at McGuffey Art Center' Main Gallery. This show included work by Carol Grant, - Ceramicist, Renee Balfour - Wood Sculptor, and myself. We worked together for about six months planning, experimenting and making. We had high points, points of contention and "eureka" moments during the process. Our aim was to have a few solo pieces and many pieces that were the result of true collaboration. The show met our expectations and was a great experience on so many levels. 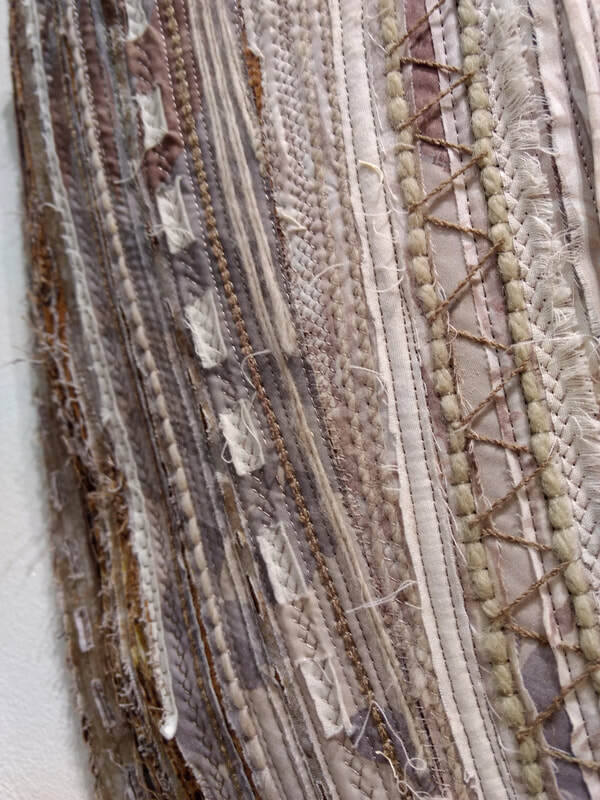 'Nine Patch' is a collaboration between Carol Grant and myself. Carol initiated the project idea by creating the four corner boxes. 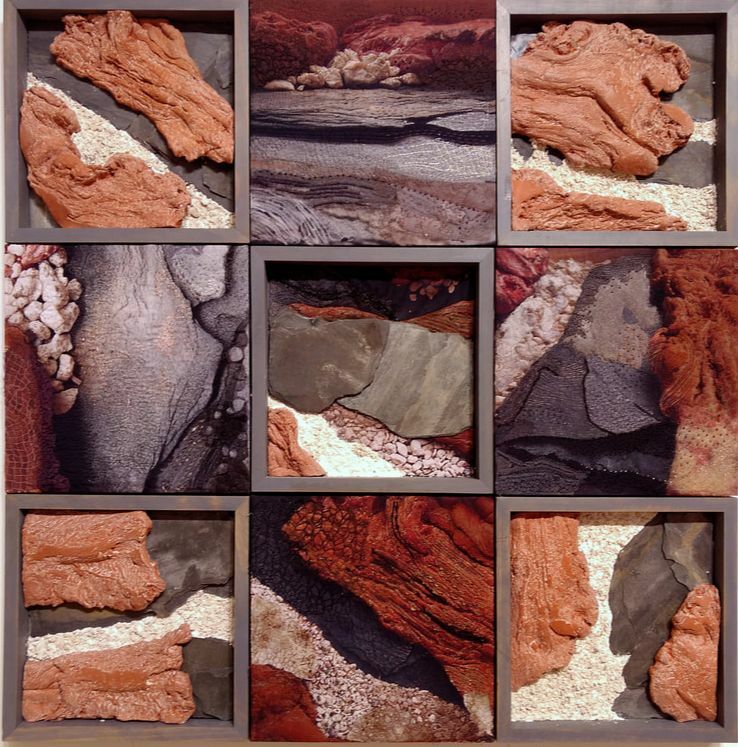 Each box contains a ceramic, wood inspired shape surrounded by small rocks and slat slabs. I took photos of the corners and, after printing them on fabric, I layered, stitched and beaded the side center pieces, then mounted them on boxes. it is about 36"x36". 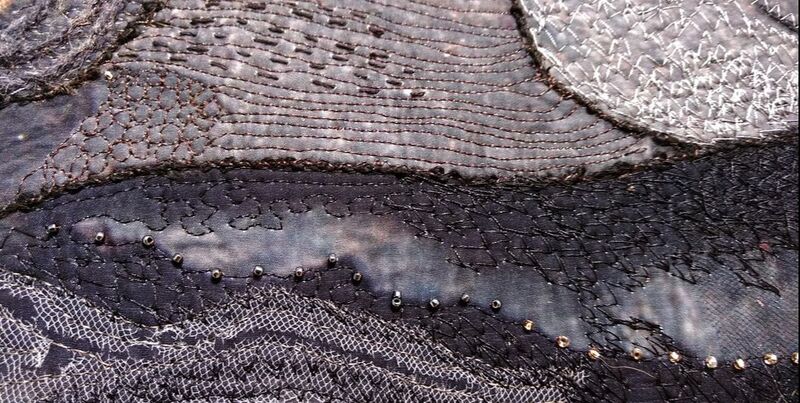 Below are close-ups of the stitching. The above two pieces were collaborations between Renee Balfour and myself. On the right is 'Scapula' and on the left 'Fleeting'. The details show the fiber stitching involved with each. 'Scapula' is about five foot tall, and the fiber work on it is the first three dimensional work I have done of that scale. 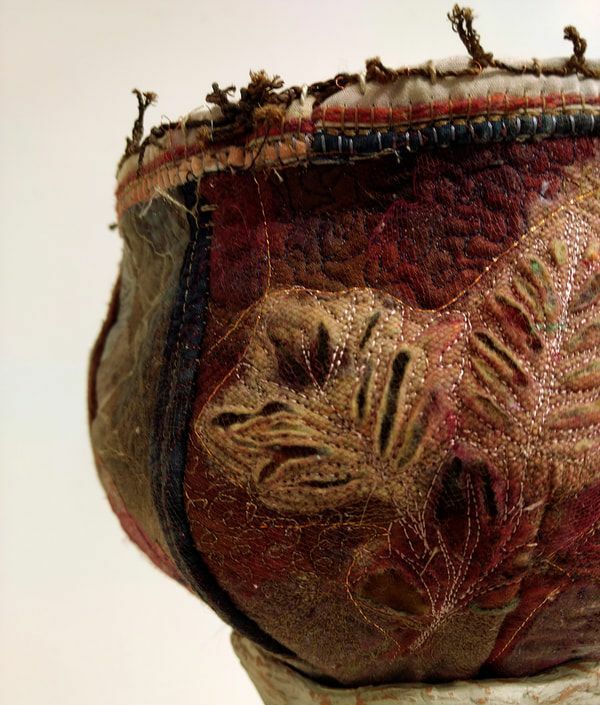 The fiber work was done in response to the wood. Scapula has now been reworked, you can see the reworked image HERE. 'Fleeting' is about 24" x 30" and the fiber work is mounted on stretcher bars. 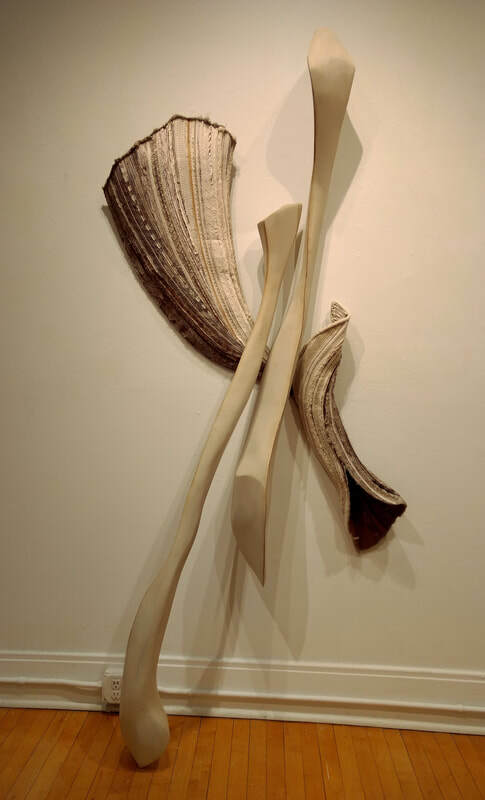 The piercing wood shapes are visually (and physically) pushing the piece off the wall. This piece has been reworked and is now shown with rocks instead of spears. you can see that image HERE. Vessels were part of our experimentation process, and turned out to be a wonderful part of the process. One of us would start a vessel and then we passed it on to another artist to add to it. Through this process we were able to learn more about the limits and potential of each others' medium. It was also very helpful in helping to solve technical issues of connecting different media. On the right and below are closeups of the fiber part of some of the collaborative pieces.